The mission of the Arizona Jazz Masterworks Orchestra is to preserve, present, promote and perpetuate the rich heritage of jazz music in an all - inclusive manner. Nurture the growth of jazz, encourage the appreciation, ensure the community, young and old, learns about jazz and grow to respect the intelligence, sophistication and scholarship of this ever – evolving art form, encompassing the big band sound and contemporary jazz orchestra music, as a viable art form. Performances and programs will enrich the public’s understanding of this unique American treasure by presenting significant jazz music performances featuring musicians in engaging musical performances and stimulating educational activities that are based on scholarship and research. The Arizona Jazz Masterworks Orchestra is an organization of the finest musicians and the most accomplished jazz soloists in the greater Phoenix Metropolitan area. Performance credits by the musicians encompass all classical, pop, contemporary and jazz idioms. These musicians have performed with everyone from the Royal London Ballet and the Phoenix Symphony to Ray Charles, Frank Sinatra, Gladys Knight, Johnny Mathis and Al Jarreau. 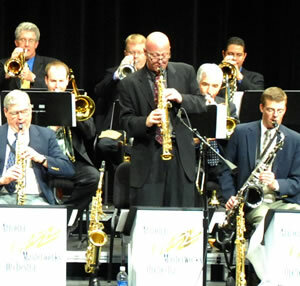 Musicians of the Arizona Jazz Masterworks Orchestra are commonly found in the orchestra pits of Valley theaters, lead their own small jazz groups and have released numerous CDs as leaders and are present on many other local and national recordings and tours. Orchestra members are not only musician/artists but are also music educators, teaching privately, in public schools, colleges and universities. The ensemble performs historically significant swinging big band music from composers Duke Ellington, Billy Strayhorn, Count Basie, Benny Goodman, Les Brown, Jelly Roll Morton, Ernie Wilkins, Benny Carter, Thad Jones, Fletcher Henderson and many more. Concert music will also include new works by contemporary composers Vince Mendoza, John Clayton, Bob Brookmeyer, Wayne Shorter, Chuck Owen, Maria Schneider, and more. Music from the commercial and jazz big bands of the 30s and 40s including Duke Ellington, Count Basie, Benny Goodman, Artie Shaw, Glen Miller, Les Brown, Stan Kenton and others. Originals, standards, swing, pop, groove music....something for everyone!! A Be Bop and Hard Bop quintet performing classic small group jazz from the 1940s and 50s featuring Armand Boatman, Dwight Kilian, Dom Moio, Fred Forney and Jerry Donato. Whether you need an all Count Basie or Duke Ellington show, or some swinging big band music for your next special occasion, The Arizona Jazz Masterworks Orchestra can create a show to meet your entertainment needs. Individual members of the Orchestra can work with school jazz groups or present a Master Class for a group of instruments in a school setting or prior to a concert. The ensemble appears as guest performers with a school jazz band on a concert or as an opening act for touring artist. Historical backgrounds and stories about the music, composers and legendary performers whose music is featured during AJMO performances.